"I think we can say that the Battle of Britain might never have been won... if it were not for the radar chain"
"It is doubtful whether there is any point in continuing attacks on radar sites, in view of the fact that not one of those attacked so far has been put out of action." 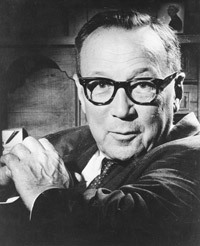 ACM Dowding, unlike Hermann Göering, recognised the importance of radar and its integration into an overall air strategy. Initially German bombers targeted radar and sector stations but by August 1940 Göering, believing these attacks ineffective, decided to concentrate on the bombing of British cities. 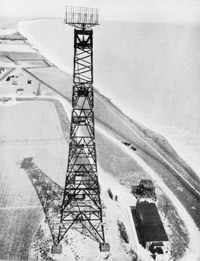 Göering's inability to grasp the vital role radar played in British air defence enabled the RAF to retain the advantage in the air. Despite its success, the Chain Home system did have drawbacks. A major weakness was that once German bombers crossed the coastline they were unsighted by radar - the CH stations faced out to sea and the CHL stations signals were affected by returns from the land surface. It was then left to the Observer Corps to watch the skies and continue the plotting of enemy aircraft formations. Another problem was that signals could be misinterpreted resulting in inaccurate information on enemy aircraft height and strength being supplied to the British fighter pilots occasionally placing them in dangerous situations. Nevertheless, the presence of radar did remove the need for continuous air patrols, giving breathing space to exhausted air crew. The question then remains, was it radar or the failure of Göering to appreciate its importance that led to the British victory? Unlike modern radars, CH aerials did not rotate. A broad beam of radio pulses was transmitted, 'floodlighting' a vast area. Chain Home stations were mounted on cliffs and high ground to increase the detection range, which could be up to 320km (200 miles). The photograph shows the installation at Poling, Sussex. 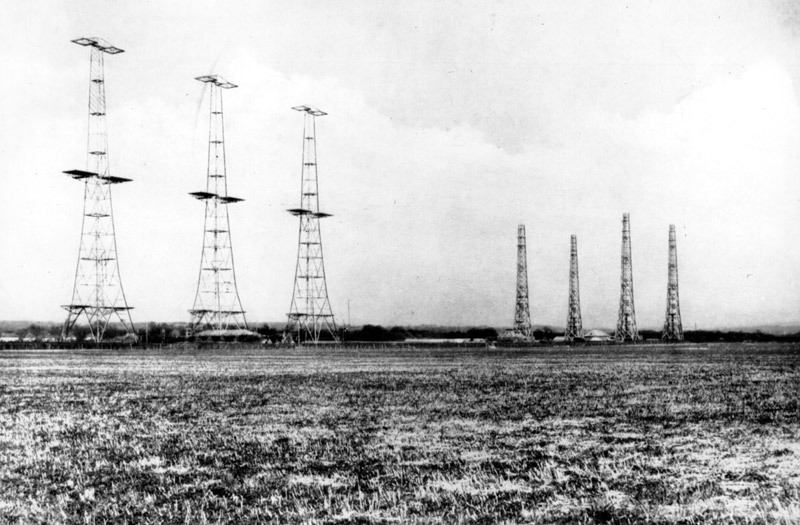 On the left are three in-line 110m (360ft) steel transmitter towers with transmitting aerials suspended between and on the right are four 73m (240ft) wooden receiver towers placed in a square. Low flying aircraft could escape detection so Chain Home Low (CHL) was developed in 1939 to cope with this problem. CHL's rotating aerial transmitted a narrow beam, rather like a 'radio searchlight'. It could not measure height but could detect aircraft flying at 152m (500ft) at ranges up to 177km (110 miles). The traces were displayed on a circular screen much like modern radar displays. 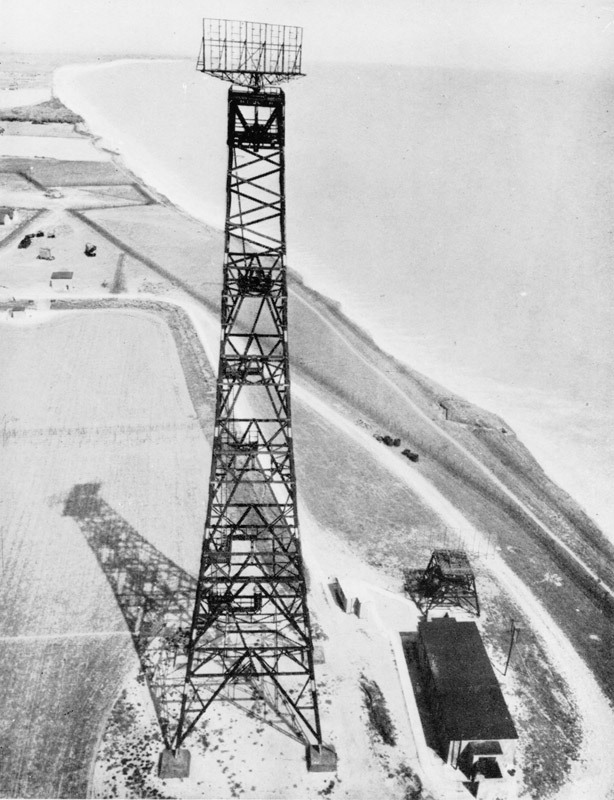 Some CHL stations were set up on cliff tops, but in low-lying coastal areas the aerial was mounted on a 61m (200ft) high tower. Once the Germans turned to night bombing RAF Fighter Command was in difficulties. The early Defiant and Blenheim night fighters were stop gaps and largely ineffectual. Only when Beaufighters equipped with Airborne Interception radar (A.I. Mk IV) came into operational service did an effective defence begin to be built. 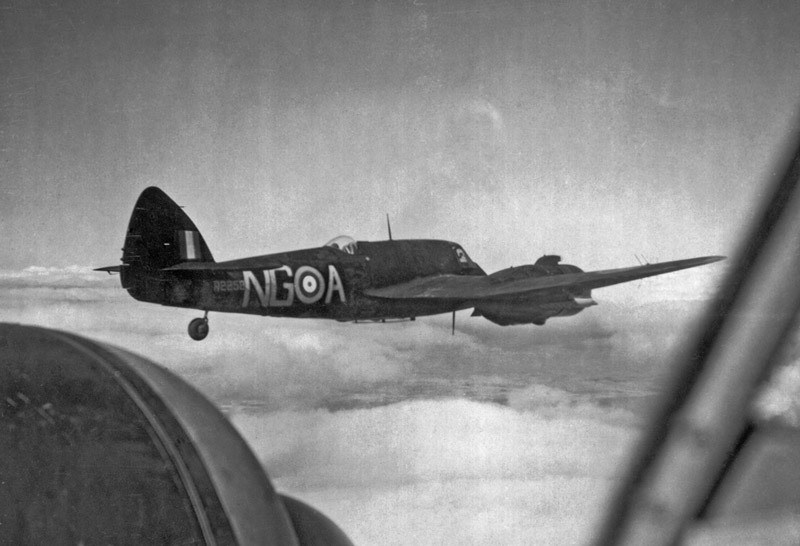 Here, a No 604 Squadron aircraft is seen airborne in October 1940. This unit scored the first A.I. 'kill' on 19 November when a Junkers Ju 88 was shot down. 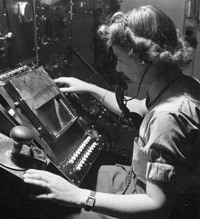 Here we see WAAF radar operator Denise Miley plotting aircraft on the CRT (cathode ray tube) of an RF7 Receiver in the Receiver Room at RAF Bawdsey CH station. The green cathode ray tube displays the signal received. At the left hand edge of the screen is the pulse sent out by the transmitter: the signal returned by an aircraft can be seen towards the centre of the screen. The scale across the tube is calibrated up to 322km (200 miles). A cursor is moved by the operator to the position of the trace, and this information is automatically passed to the calculating machine. Her right hand has selected the direction or height finding and her left hand is ready to register the goniometer (angle measurer) setting to the calculator. To measure the bearing from the radar station to the aircraft the operator turns the goniometer until the 'blip' disappears. The scale is calibrated in degrees and this information also passes to the calculator. By means of a switch the goniometer can be connected to the height aerials and the process is repeated to enable the calculator to compute the aircraft's position and height.